Japan's Iaidou Hokuriku Federation Constitute consists of 4 branchesm5 Dojos. The charman is Cyouji Sakai (8th Dan) Hanshi. The main office is in Fukui city. 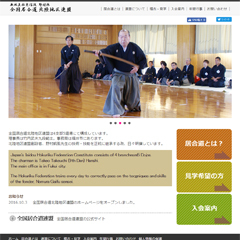 The Hokuriku Federation trains every day to correctly pass on the tecgniques and skills of the fonder, Nomura Gaifu sensei. Copyright © 2011 KARAKURIYA All Right Reserved.